The Buffet Senzo Alto Saxophone features a red copper body with a brushed finish. Popular among professionals for its ability to provide full bodied warm sounds, suitable to classical music. This model has been reborn to meet the needs of today's market. The design also features adjustable palm keys, yellow brass keywork, blue steel springs, leather pads, handmade bell with unique engraving and a BC-patented resonance cavity in the neck. Since 1825 Buffet has developed around the recognition of its instrument manufacture. The guarantee of such quality is the charm to a player's heart and as all products are made in either France or Germany workshops this quality is continuously reliable. All workers start as apprentices to learn everything they need to from highly skilled craftsmen, however the most important skills are dedication, passion and patience. Since birth almost every Buffet instrument has been continuously tested and developed. Listening to its players needs, Buffet has adapted the instruments to cope with the period in time. Senzo announced the launch of their brand new professional saxophones, based upon their originals. Buffet has transformed this saxophone to meet the needs and expectations of the musical industry in this modern time. The word Senzo means ancestor in Japanese, so is relevant to this product because the Crampon's Saxophone range pulls together Buffet's traditional musical excellence and their modern design approach. This new range of saxophones has been inspired by the legendary Super Dynaction and S1 models, whilst also keeping those recognisable round sounds that Buffet are known so well for, with some added improvements along the way. Buffet's pure copper body provides full bodied warm sounds that are suitable to classical music. The Buffet Senzo Saxophone in an original because of its ability to produce ease of play for users whilst also providing free blowing in every register. Players can vary their music range widely from velvety low to impressively bright high notes, to express their style of music. Buffet have worked hard to perfect the intonation of the sax in order to produce an instrument capable of playing extended and enhanced ranges of tuned sounds. Another feature that was highly looked upon was the neck bore flexibility. Buffet increased the flexibility of play throughout the saxophone's register. Used to highlight the pure copper chosen in the manufacturing process of the saxophones body, the hand-made floral engraving is a real addition to this product, as well as a necessary step towards the revamp of the Buffet Crampon saxophones. The Buffet Saxophone range comes with a wealth of knowledge and experience from some of the finest craftsmen in the world. 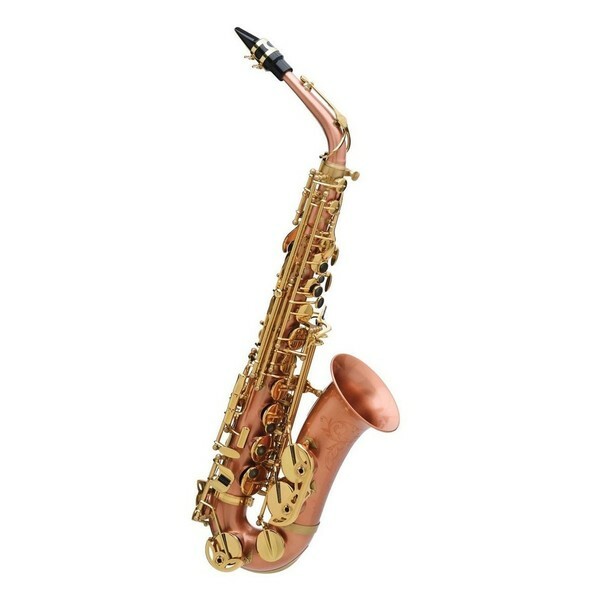 Made in Markneukirchen in Germany, this saxophone will ensure many years of hassle free playing through its ease to service and maintain. The Buffet Senzo Saxophone comes with a range of accessories, enabling players to get started as soon as the package arrives. Included is a ligature and reed, as well as a case, which allows for easy storage and travel to and from school, rehearsals, gigs and concerts.